Here at Pocono RV, we always strive to give you the best deal on RV parts and accessories that we have for sale. We know that an RV is a big investment, but we also want you to be able to afford add-ons and features to make it more personalized, or to modify it. We guarantee the best prices out there, so get the best deals on RV parts with a selection of money saving coupons to keep you on the road. Check out our coupon list below and save money when you buy from Pocono RV. Visit our shop in Wind Gap to take advantage of these offers while they last, we serve clients from Lehigh Valley, East Stroudsburg, Saylorsburg PA and Hackettstown NJ. READY TO GO! INCLUDES BALL! *May not be used or combined with any other discount offer. Sizzling Summer Sale! Get yours today! 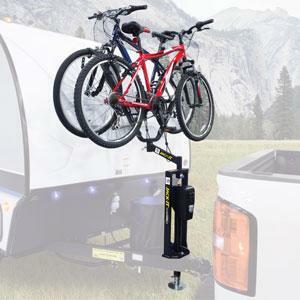 Jack -It over the hitch bike rack! Holds 2 bikes! Save room in the bed of your truck or SUV! part #3049756 While supplies last. WAS $225.00 … NOW $195.00.